I have a wonderful pumpkin cake to share today! About this time last year I had gone on a pumpkin cake baking spree. It never resulted in a blog post as I was disappointed with nearly every recipe that I tried. Some cakes were good, but not so good that I felt they warranted an endorsement. I had some rather particular ideas of what a pumpkin cake should be like: moist, tender and with just enough spice to provide those fall warm and fuzzy feelings. Unfortunately though, I wasn't feeling so warm and fuzzy after baking and tasting all those cakes. You see, the more recipes I tried, the worse the cakes seemed to get. Some were heavy with spices, which I thought I would enjoy, but often found they gave the cakes a harsh edge. Other cakes I found a bit soapy, which I attributed to the citrus or too much cardamom or ginger in the base. One particular horror to emerge from my ovens was a cake that managed to taste of baking soda and metal. In all, it was a disappointing run. So I gave up and moved onto other baking projects to populate the blog. I figured I would pick up the quest again when my desire to eat pumpkin cake returned. Well, along with the damp fall Seattle weather, that desire has returned and this time I found the cake. When I tasted it, I knew no tweaking on my part would improve upon it. It was just right. Delightfully moist and echoing the flavors of a pumpkin pie. It was the perfect base for my whipped cream cheese frosting. I guarantee a generous slice will provide those warm and fuzzy feelings. The recipe I found in Bake: Essential Techniques for Perfect Baking. A cookbook I enjoy for both the recipes and the emphasis it places on techniques to execute recipes well. For this cake I'm going to make two recommendations right off the bat. First, use fresh ground nutmeg. We're using a generous amount of nutmeg in this cake and as one of the key flavors, it is important to use what tastes best. Whole nutmegs are not impossible to find and nor should they be expensive. I get a baggie of 6-8 nutmegs from a small local Indian/Pakistani market for $2. Specialty food stores will often have them and I've been told even Walmart even stocks them. They're always great to have around this time of the year. Crack one on your counter and give the inner nut (the shell is the spice mace) a good grating with a microplane. It will require nearly a whole nutmeg for this cake. Second, use canned pumpkin. Yes, yes, I know it is in vogue among foodies looking to earn gold stars to drag in a large squash and make their own puree but just this once, don't. The canned stuff has just the right level of moisture for the cake and packs the right amount of pumpkin flavor. Okay, are we ready? Let's get down to some cake making! You'll find this recipe to be not only delicious but also simple and reliable. Of course just by saying that someone will mess up and then email me furious, but I'll go ahead and tempt fate by saying it anyway. Preheat your oven to 350°F and prepare two 8" or 9" round cake pans with a light coating of non-stick spray and then line the bottoms with parchment. In a large bowl, sift together the flour, granulated sugar, baking powder, baking soda, salt and spices. Once sifted, give it a good mixing with a whisk to ensure everything is evenly distributed and then set aside. In a second large bowl, add the brown sugar and a third of the pumpkin puree. Combine the two with a spatula, pressing firmly to ensure there are no rogue lumps of sugar. Once lump free, add the remaining pumpkin and oil. Blend with a whisk and then add the eggs, one at a time, stirring with the whisk to incorporate after each addition. Add the dry ingredients a third at a time, blending after each addition. Divide the batter between your two pans and place into the oven on a lower-middle rack. Bake for 40-45 minutes until risen and firm to the touch. Let the cakes stand in the pans on a wire rack to cool for 10 minutes. Then unmold onto the racks and turn right-side up to cool completely. Once cool you can begin on my whipped cream cheese frosting. This recipe has been making the rounds on the internet and has been very well received. Light, fluffy and not too sweet it is perfect with this cake. If you haven't tried it yet, you probably should. Yields enough to frost a 8" or 9" double layer cake. Sift the powdered sugar and add the cream cheese and vanilla to the bowl of your mixer with the paddle attachment. Beat them thoroughly until fluffy and completely smooth/lump free. In a separate bowl, beat the heavy cream to nearly stiff peaks, then add the whipped cream into the cheese mixture, scrape down the sides of your bowl and quickly and briefly beat to combine. Do not over beat. Assemble your cake by trimming any humps off the top of the cake and place trimmed side down on your serving platter. Tuck strips of parchment under the cake to protect the platter during frosting, if desired. Dollop a generous amount of frosting onto the first layer--about twice as much as seen below--and smooth into an even layer, about 1cm thick. Top with the second cake, again trimmed side down, and proceed with using the remaining frosting to cover the cake. Since pumpkin spice cake evokes a certain understated homeyness, I decided to treat the exterior simply. Coating it with the whipped cream cheese frosting and using my small offset spatula to groove the outside edge. Should you wish to dress up the cake, consider forming little pumpkins or acorns from white modeling chocolate or dotting the cake with with whole or crushed candied pecans. Even a drizzle of caramel would be welcome here. To store, keep refrigerated for up to five days. Keep the cake well covered to prevent it from absorbing any odors while in the fridge. Allow to stand 10 minutes before cutting and serving. I love the idea of pumpkin but not sure if I dare try it! Brilliant! Tomorrow is Thanksgiving in Canada and I wonder how many cooks would have loved this cake for their holiday dessert. I will certainly be giving it a try. this is the EXACT kind of cake I was looking on your site for last week ! Ohhhhh please, please,please... cant wait to try this whipped cream cheese frosing!!!!!!!!!! Sounds lovely! I bet that cream cheese frosting is amazing. Boy! That's one gorgeous, delicious looking cake! I always appreciate extra tips and try to offer them myself. Like you, I've been held up on several recipes because I like to be happy with a recipe before I post it. There's a cake I made several months ago that was actually very good and I should have posted it, but I decided I wanted to make it one more time...I have not done that yet, but I will! 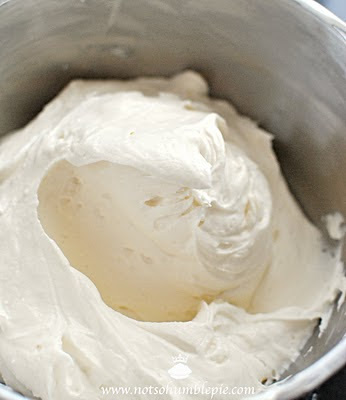 Your version of cream cheese frosting looks divine and I want to try that sometime...bookmarked these recipes! Thanks! Oh my goodness that looks good!! I will definitely be trying it. I just posted a great pumpkin bread recipe. I am definitely in a pumpkin mood (clearly :p brought on by the season). Looks delicious! Here is Australia, pumpkin is something we eat regularly as a savoury vegetable with our dinners, there are always a few varieties to choose from at the supermarket. And its yummy. However there is no such thing as canned pumpkin. Does this mean this cake is out for me? What an absolutely gorgeous cake and photos! Flawless, well done! :D I love pumpking cakes, and I'm so glad you took extra time to make and post such a perfect recipe. Nope. We're mostly avoiding them in this recipe as there are so many varieties of pumpkin, all edible but not all suitable. I didn't want folks going out and grabbing just any pumpkin for this cake. The kind you use for carving on halloween for example, that's not a pie pumpkin yet I see people making puree and baking with it (Even Pioneer Woman? Wah?). It works I suppose, If you don't mind a paler, watery puree with little in the way of flavor. Anyway, before I ramble on too long and make people mad at me for snubbing their jack-o-lantern pies (sorry! ), yes you can make pumpkin puree yourself, but be sure to use the right kind of pumpkin. I'd recommend locating the orange fleshed Sugar Pumpkin to roast and make your puree from. They're small, flavorful and do the job. "If you absolutely have to use a fresh vegetable, then use cooked, pureed winter squash (but not spaghetti squash)." So something like butternut would likely work. The author also suggests using roasted, pealed and mashed sweet potatoes as another option. That is one beautiful cake! Not to mention probably very tasty too! Do you think this would be good if I left the cinnamon out? My husband is allergic to cinnamon. LOVE pumpkin! We're in a bit of a canned pumpkin shortage here in the nation's belly button. I had to go to 3 stores before I scored some Libby's for the season. Then our youngest asked "why are we buying 12 cans of pumpkin?!" But this cake is definitely pumpkin worthy! Tough to say, for me it is hard to imagine the flavors of pumpkin pie without cinnamon. Of course, being allergic he is probably used to it. If you make pumpkin pies for him, how do you season them? As whatever you do there would likely work for the cake too. Can he have allspice? A little of that, maybe half of a teaspoon might be a workable in exchange for the cinnamon. The batter is thin enough to allow easy making of cupcakes. Spot on about the baking time, my best guess is to aim for between 24-30min, until firm to the touch. Another year of pumpkin shortages! Lucky I stockpiled last year and still have a few cans yet. I can't wait to try this! I'm beginning to really develop a love for pumpkin spiced treats and this looks simply amazing. WOW!!! A really spectacular pumpkin cake!! !It's fantastic! Lots of work ( not to mention butter ) but it even tops most other desserts in our house. I'd love to get your opinion on it. Oh, and I used canned pumpkin - each and every time I've made the above mentioned cake. Perfect. I absolutely love brown butter so I will be trying it, thanks! But they are still very tasty, and I'll figure out something to do with my 5/6th can of pumpkin. Haha. It looks so yummy, I had to pin one of your pictures to my Noms pinterest board (yes, noms - no other word does justice to such tasty treats) as soon as I saw them! My poor hubby didn't start off life allergic to cinnamon; he knows exactly what he is missing! We have not figured out a work around for pumpkin pie. I think we'll try the recipe with your allspice suggestion and see what he thinks. I'm going to have to remember this recipe in 6 months time when it's autumn over here, it looks delicious! Absolutely beautiful cake! It's sounds and looks delicious. I will definitely be trying out this recipe. I live in Ireland, where, if canned pumpkin appears at all, it does so at ridiculous prices. Love the sound of this cake--wish the dry ingredients were measured by weight, though! I usually use the potimarron pumpkins for any baking or cooking. They're smallish, round, and a very deep orange-red colour. Nice flavour, too. I've never had a problem with it being watery, but you can always let it drain over night in a sieve. Thanks for the recipe! We have a bumper pumpkin harvest from our backyard, and this was perfect for using up one of the smaller pumpkins. I made these into muffins and they turned out great! The (embarrassing) part is that I left out ALL five eggs. Yet, the muffins rose marvelously and still turned out with a beautiful, crisp top and moist, tender inside. I had only one tsp of ginger powder left, so I added a sprinkling of white pepper to give it a bit of a kick. So, for vegans curious about adapting the recipe, you could probably omit the eggs altogether. That said, next time I try this recipe, I will add the eggs to test the difference. Without the eggs, the recipe yielded 18 muffins. This looks amazing... I may have try this. Thanks for posting! I have to say I was itching to make this and a get together with friends proved to be the perfect excuse. Even my husband who doesn't like pumpkin spice flavored desserts liked this cake! It is DELICIOUS and will be made again! Oops; in the frosting you forgot to say when to add the vanilla extract, and I entirely forgot it! Of course it tastes wonderful without (how can you go wrong with fat, fat, and sugar? ), but you might want to update the recipe to include adding it so I remember next time... I assume it can be safely added to either the cream cheese or the cream while being beaten. Qué maravilla!!! Seguro que está delicioso y el contraste de color es precioso. Tienes un blog estupendo, te felicito por estas fantásticas recetas. worked perfectly. Both recipes are "keepers." Thank you! Thanks so much for posting your pumpkin cake goodness! My husband is one that regularly asks for pumpkin pie for his birthday. This year, when I told him about this cake, he asked for it instead. It was brilliantly easy to put together and the flavors all went so well together. We both loved it! WOW! That's all I gotta say! Btw, I've passed on the Versatile Blog award to you today. Thank you so much for all your beautiful photos and recipes! This looks fantastic! Do you know if the layers freeze well? I would love to make the cake ahead of time. Yes, the unfrosted cake does freeze quite well. Just wrap it well, like any other cake, to prevent any freezer burn. I only put a 1/2 teaspoon of ginger and upped the cinnamon and nutmeg though because i'm not a huge ginger fan. Thanks so much for the recipe! !